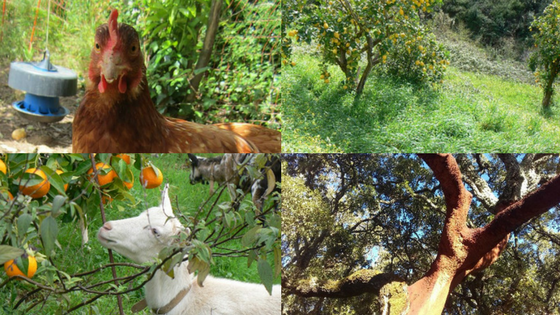 Holiday in the Algarve at our organic farm. Home » Holiday in the Algarve at our organic farm. Book your holiday in the Algarve at our organic farm. Book an EARTH BUILT COTTAGE. In the hinterlands of the Algarve you will find the rustic peace and quietness you are looking for. Recover in nature from the day to day fuss. We offer you a nice accommodation, cosy hospitality and organic products. There are plenty of sites around to visit to make your holiday a nice adventure. 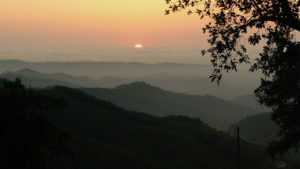 Our organic farm Terra do Milho is situated in the beautiful Serra do Monchique. This forested mountain range in the hinterlands of the Algarve is known for its peace and quietness. It is a natural park with many interesting hiking paths. There is a rich flora and fauna, unique in the world. Here you can hike through the cork-oak forests of the Serra de Monchique. Farmstay at our organic farm. On our organic farm you will find the peace and quietness that is characteristic for the Serra the Monchique. In summer it makes a big contrast to the very touristic south coast. Waking up in the morning with a cockerels cry. Having fresh eggs with some goats cheese in the morning. Watching the chickens free range and the goats being milked in their parlour. Have a chat and a glass of home made juice with Tom to learn more about our farm. You can watch Monique making cheese and even learn it yourselves. These are some of the adventures our farm has to offer. Depending on the time of the year there are different types of fruit in the orchard that are for sale. We also have a big vegetable garden with surplus products you can buy. We will have a small stock of organic product like rice, pasta and flour for cooking. The small town Monchique, 6 km from us, is worthwhile going to for a visit. It has a nice old town to wander around. Monchique would also be the town for your daily shopping as well. On Fridays there are several organic producers selling at the towns market. Every second Friday of the month there is a big Gypsy market. Besides shops Monchique has some really interesting restaurants to visit. There is a typical Monchique Restaurant with excellent tradition food from the region, a Charret. Another restaurant serves more modern versions of the traditional Monchique food, O Luar de Foia. These are just two examples of the many option available. Historical towns in the surroundings. Silves is an interesting and beautiful city to visit, 40 km from us. It used to be the old Moorish capital of the Al Garb. this is how the moors used to cal the Algarve. It has an interesting castle to visit. The caste has roots that go back to 200 BC. Many ancient people lived in the citadel. During the Moorish times the poet and Emir Al-Mutamid used to live in the castle. He is known for planting an orchard full of almond trees for his wife. She came from a northern region and missed the sight of snow. This made her very sad. The almond flower petals that drop in spring would replace this sight to make her happy again. Lagos is another historical site nearby. There is a fortress that tells the story of the famous Portuguese seafarers stated their historical journeys to the east and the west. The town is surrounded by an ancient wall. On Saturday mornings it has a large farmers market that is worth visiting as well. Not far from Monchique is the coastal nature reservate of Vicentine Coast Natural Park with its unique species of animal and plant life. The park stretches 100 km along the south Portuguese coast. It’s landscape is markt by astonishing cliffs and many small and large beaches. There are amazing hiking routes along this incredible coastline. Click here below to make a reservation. The Earth Built Cottage is a newly restored farmers house with a cottage-looking outside and a modern fully equipped inside. Built with natural materials like limestone and clay, chestnut and eucalyptus. It’s on a spot with a nice view all the way to the west coast of the Algarve. After coming back from your adventures relax and enjoy the peaceful sunset at Terra do Milho.